Submissions are now being accepted at End of 83, a literary magazine published online and in print by the Baltimore Writing Hour, a public writing group in Baltimore, MD. 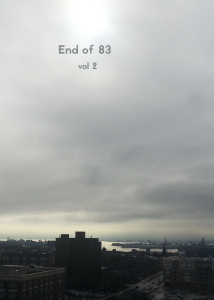 End of 83 seeks to publish the best in poetry, fiction, nonfiction, illustration, and photography. They love good pieces about Baltimore and the Mid Atlantic but do not exclusively publish on these themes. Please take a look at what they’ve published to see if your work would be a good fit for our magazine. Full submission guidelines can be found here.